It is almost five months since Chris Wilder produced his heartfelt and astonishing post-match interview following the Cobblers’ 2-1 Sky Bet League Two win at Notts County. Chairman at the time, David Cardoza, was stalling on selling the club, a club that thanks to an unpaid tax bill was in very serious danger of ceasing to exist. 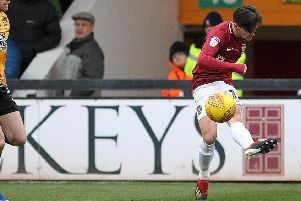 The staff at Sixfields hadn’t been paid for almost two months, while the Professional Footballers Association had stepped in to pay the players. It was a worrying time for everybody connected with the football club, despite the fact the team, against all the odds, was continuing to excel on the pitch. Kelvin Thomas, a friend of Wilder’s from their time together at Oxford United, was waiting in the wings with a deal to save the club and take over at Sixfields - but Cardoza wasn’t in a hurry, insisting other buyers were also interested. Throughout the previous weeks and months, Wilder had kept his counsel on what he felt about the off-field issues blighting the club, consistently saying he was just concentrating on doing his job, sticking to on-field issues. But on Saturday, November 21, 2015, Chris Wilder finally snapped. He made it clear he was not happy (or ‘appeh, as the Sheffield-born Wilder pronounces it!) and in the process wrote himself into Northampton Town folklore, and ensured he will forever hold a special place in the heart of every single fan of the Cobblers. “I’m so proud of the players, the staff and the supporters,” said Wilder to a press pack he had previously told to ensure ‘they have a full battery’. “The players have been unbelievable over the last four or five months with what they’ve had chucked at them and I’ve kept quiet about a lot of things but there attitude has been unbelievable. “No one is getting paid and it is remarkable how we are keeping things going. How long can we not get paid for? It’s not right and it can’t go on. “I know there is a deal to be done that will take this club forward, I totally respect the guys in the background who are trying to put something together but that is a rescue package and I know what is the best deal to take this club forward because I’ve seen it. “That deal is on the table now, we are playing with people’s livelihoods here and that deal has got to be done. “The unity that everybody is showing in backing us is incredible but we can’t wait any longer to get this deal done. “What’s happened over the last few months is a complete shambles, from different people and different organisations and I just can’t understand what is going off at this football club because it is tearing us all apart. It was a key moment, perhaps THE key moment, in an extraordinary season. Just days later Cardoza at last agreed to sell the club to Thomas, who was at the helm before the team took on Yeovil at Sixfields on November 28. The club was saved, and there is little doubt that Wilder’s passionate outburst played a major part in that Thomas deal finally getting over the line. This week, the Cobblers are again preparing to take on Notts County, and there is a nice symmetry to the fact the east stand, the building at the root of all the club’s problems, will be used for the first time in almost two years with almost 2,000 new seats having been installed. It is the most obvious sign of the club’s off-field progression under Thomas, and this week Wilder reflected on his ‘Meadow Lane moment’. “You weren’t expecting that were you? I get pulled up for saying ‘appeh’ all the time,” beamed a relaxed Cobblers boss, who went on to speak of his pride in whatever part he may have played in the survival of Northampton Town FC, and the parts played by many others too. “We had kept quiet for a long time and possibly far too long. “It was a moment where I spoke for the group, staff and hopefully on behalf of the supporters. We got a great reaction and we obviously moved on very quickly after that. “If I’ve played a little part in helping with all that then that was great, but there were a lot of other things that happened, an awful lot of people who have played major parts – staff not getting paid, players being paid late and other people doing stuff for the club to make sure it survived. “You had supporters raising money, and other people stepping in. “I was respectful at the time of a rescue act by genuine people that love this football club and wanted the club to survive. “It has been an unbelievable effort from that day. “The performances the players were putting on in that period, the support we took to Notts County that day, and we even got a rare Brendan Moloney goal, which was fantastic. “Then there was going over to the supporters at the end of the game, and then doing that interview and I have to say it will stick with me for a long time, possibly for as long as I’m in football management. “You talk honestly and I have always said there is a place for that in football. “Whether you are smashing or praising players, or whether you show you care as it was on that day. “Managers come and go, players come and go and we have talked about this, but the club and supporters always stay and they have to stay. “If we have played a part in surviving and moving forward then that’s great, we can be very proud of what we’ve done but we would really like to put the icing on the cake and top it off. “The survival of the club was always the first and foremost thing, but to gain promotion and to hopefully get what we deserve in terms of winning the league would cap it all off.